The 34th SS Volunteer Grenadier Division Landstorm Nederland was a Division during World War II which wasn't officially an SS unit, although it was subjected to Waffen-SS laws and jurisdiction of the SS-und Polizeigericht. The men wore the Feldgrau uniform of the Waffen-SS, but without the Sig-runes. The German officers and transferred eastern front veterans were allowed to keep wearing the runes.. It was formed by the converting of the SS Volunteer Grenadier-Brigade Landstorm Nederland into a division. It comprised volunteers of Dutch background and saw action on the Western Front, but its strength never reached more than a brigade. Their insignia features the Wolfsangel rune. After the successful formation of the 4.SS-Freiwilligen-Panzergrenadier Brigade Nederland, it was decided that a second Dutch SS formation should be raised. The recruits were drawn mostly from the Nationaal-Socialistische Beweging (the Dutch Nazi Party). The NSB leader, Anton Mussert encouraged his followers to join the new formation. In 1940 Arthur Seyss-Inquart, the Reichskommissar for the Netherlands, had approved the creation of an NSB paramilitary police formation named Landwacht Niederlande. The Landwacht served as an auxiliary police force and was involved in the rounding up of Jews, Communists and other groups deemed undesirable by the Seyss-Inquart and the NSB. On 12 March 1943, the Waffen SS ordered the formation of a Dutch volunteer regiment, the SS-Grenadier Regiment 1 Landwacht Niederlande. Unlike the Nederland brigade, the Landwacht Niederlande was to be a territorial defence unit, and so recruits did not have to fear service on the Eastern Front. Recruits for the Landwacht Niederlande flowed in. Service in the regiment meant a job, money, food and an escape from forced labour in munitions factories. Added to this, the regiment was not officially a part of the SS, and so the SS runes were not present on the volunteers uniforms, with the traditional grenade of Landwacht units being worn in its place. While many recruits were drawn from the paramilitary formation of the same name, a recruitment drive resulted in 130 Dutch veterans from the 5.SS-Panzergrenadier-Division Wiking and 11.SS-Freiwilligen-Panzergrenadier-Division Nordland transferring to the new formation. While these veterans provided the cadre of NCOs for the new formation, the formation was officered by German SS men, and no Dutchman was ever promoted to a higher rank than company commander. On 16 October 1943, the regiment's title was changed to SS-Grenadier-Regiment 1 Landstorm Nederland. By this time the regiment numbered 2,400 men and was still growing. Mussert was pleased, and together with the Nederland Brigade, he saw the Dutch SS as the forerunners of a new Dutch army. However, Hanns Albin Rauter, head of the SS and Police for the Netherlands planned to firmly bring the NSB under SS control, and the Nederland and Landstorm formations were steps in this direction. After the Allied breakout from Normandy, Field Marshal Bernard Montgomery's 21st Army Group began its advance along the Channel Coast towards Germany. In early September, two battalions of the Landstorm were rushed to the front in Belgium. The formation was tasked with defending the Albert Canal around the areas of Merksem and Hasselt. Poorly armed and with minimal combat experience, the two battalions fared poorly during a battle with the Free-Dutch Koninklijke Nederlandse Brigade "Prinses Irene" and was soon forced to withdraw. On 17 September, Montgomery launched Operation Market Garden an airborne offensive aimed at securing a crossing over the Rhine at Arnhem, in the central-eastern part of the Netherlands. The Landstorm's III. Battalion was completing its training near Hoogeveen. The partially trained and equipped formation was attached to the 9.SS-Panzer-Division Hohenstaufen and sent into combat against the British 1st Airborne Division in Arnhem. Having little faith in the Dutch volunteers' combat ability, the Hohenstaufen's commander held them back from action for as long as possible. On 21 September, the III./Landstorm was committed to action near the town of Elst on the Arnhem-Nijmegen highway (in the Eastern part of the Betuwe, then known as men's island or "Manneneiland" due to it being enclosed by large rivers and all civilians having been evacuated). After holding the town for several days, the Landstorm was finally pushed back by the British 43rd (Wessex) Division. The battalion was pulled out of the line on 25 September. On 1 November, the Landstorm was redesignated SS Volunteer Grenadier Brigade Landstorm Nederland. The existing three battalions were to form the 83.SS-Freiwilligen-Grenadier-Regiment, and the Waal and Rhine rivers. On 10 February 1945, the Landstorm again had its status raised. 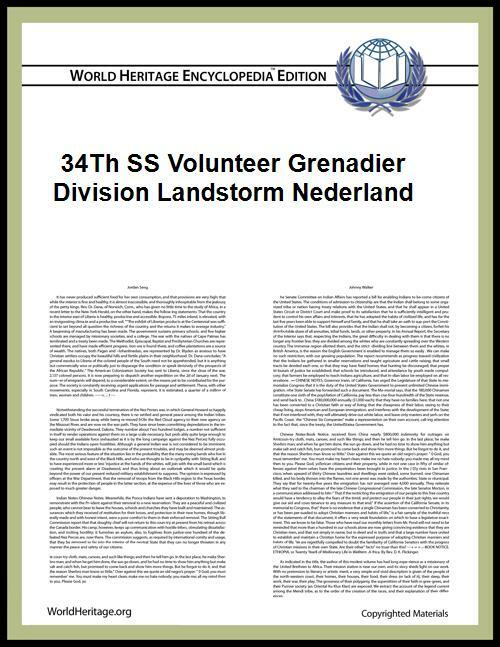 It was now to be designated 34th SS Volunteer Grenadier Division Landstorm Nederland. Despite this fact, the unit could hardly muster the strength of a weak brigade. The Division was almost immediately ordered to relieve Fallschirmjäger-Regiment 7, at that time defending the Rhine, in the area between Betuwe and Rhenen. Much of the area had been flooded to assist the overstretched German forces in their defence. Facing the division was the Koninklijke Nederlandse Brigade "Prinses Irene", the British 49th (West Riding) Infantry Division and several Canadian formations. The morale of the Division suffered when facing the Princess Irene, as the men were hesitant to fight their own countrymen, and several members had relatives serving with the Princess Irene. Despite this, the division fought well, capturing a British strong point near Zetten. However, under sustained combat, morale continued to drop and desertions increased. A plot to assassinate several officers and surrender leaked, and the responsible men were court martialed and shot. As the war drew to a close, attacks on the civilian population by the division increased, and the men of the 84th SS Volunteer Grenadier Regiment in particular were involved in several atrocities. Forced back to the area near Oosterbeek, the remnants of the division surrendered on 5 May 1945. A small unit of fanatics held out in the village of Veenendaal, engaging in combat with the Binnenlandse Strijdkrachten until surrendering on 9 May to the 49th (West Riding) Division. As collaborators, the majority of the survivors were imprisoned, and several were murdered in acts of revenge.